Influenza, commonly known as “the flu”, is an infectious disease caused by an influenza virus. Symptoms can be mild to severe. The most common symptoms include: a high fever, runny nose, sore throat, muscle pains, headache, coughing, and feeling tired. In my personal experience, this combination of symptoms strongly indicate that the viruses most probably are blocking the intake of oxygen to survive; or less probable they consume a lot of oxygen to the degree they deprives the infected organ from oxygen. But since viruses are infectious agents and not living organisms the first possibility is more reasonable. 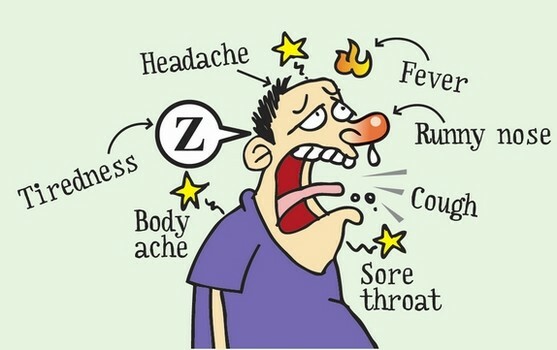 High fever, sore throat, muscle pains, headache, coughing, and feeling tired are all indications of low oxygen. While runny nose is a signs of deliberate attempts to block natural intake of oxygen through breathing by viruses. During cold environment the consumption of oxygen is high, and that is why flue gets worse without warming the body. Coughing is the natural reaction of the body to clear any obstruction or low levels of oxygen presence. Proving and understanding this sound hypothesis could lead to groundbreaking new treatments for influenza and other viral infections. How to Treat Viral Infections? It is obvious that the intake of oxygen both in the lungs and blood must be increased to compensate for the assumed low oxygen level. This could be done either by facilitating natural deep breathing for long time until the viruses are either unable to function in oxygenated organ or to provide the extra needed oxygen. The other line of treatment, which need further clinical investigation, is by administering hydrogen peroxide in various ways. Flu Treatment by Sodium Bicarbonate Irrigation and Natural Deep Breathing only. In case of flu, to increase and facilitate natural intake of oxygen both in the lungs and in blood via deep breathing the congested nose must be cleared first. To achieve this it is recommended to use a solution of Sodium Bicarbonate (half tea spoonful in a half glass of water) and irrigate thoroughly noses with the help of tea-spoon or dropper, then blow the nose until it is totally cleared from congestion. The second and most important part in treating flu is by going through regular and long sessions of deep breathing. Immediately after taking this treatment most of the symptoms of flu, like high fever, runny nose, sore throat, muscle pains, headache, coughing, and feeling tired, will be relieved while the virus still exists and trying to fight back. After few days of treatment the viruses will go away or take inactive state. There are two large population groups who have serious problems A. Those who took the vaccination then developed various sorts of autoimmune diseases; and B. Those who refuse to take the vaccine and developed flu; so what is going to happen to these two large groups? I suggest to offer them trial treatment consisting of the following: 1. Sodium Bicarbonate nose irrigation to relieve nasal congestion; 2. Regular sessions of deep breathing; 3. Oral Sodium Bicarbonate to reduce body acidity and boost the immune system; 4. Anti-fungal diet; 5. Oral Anti-fungal medication to see if it could stop the production of antibodies; plus two additional components could also be added which are 1. Various forms of Oxygen therapy like Heated humidified high-flow (HHHF) and 2. Hydrogen Peroxide. Monitoring and measuring the results will certainly help to develop flu and viral infections treatments. These viruses do not go away during the summer months – these are always in the environment. The sun’s interaction with the skin to produce Vitamin D is what helps people to not get sick with these viruses during the warmer and more sun filled months of the year. Surely, it an autoimmune disorder and this how it is being classified. We cannot isolate it, the same as in diabetes. But the only way is to find out what it does and how it does it. From my personal experience it is related to antibodies produced by internal fungal infections, which are abundant in cold countries, which make the immune system weird.